myHK: Little Red Riding Hood’s Granny Dies! Little Red Riding Hood’s Granny Dies!! I’m finishing up night time stories with my daughter E, when she gives me the sweetest look and asks for one more. I reach onto the shelf and pull out Little Red Riding Hood. “Ah, here’s a classic!” I think to myself. I tell E this is really the last one and we get started. It begins like most versions of this tale do, with Little Red’s mom asking her to bring Grandma some food. Then she meets the wolf. The wolf tricks her, goes directly to Grandma’s house and wolfs down poor grandma! 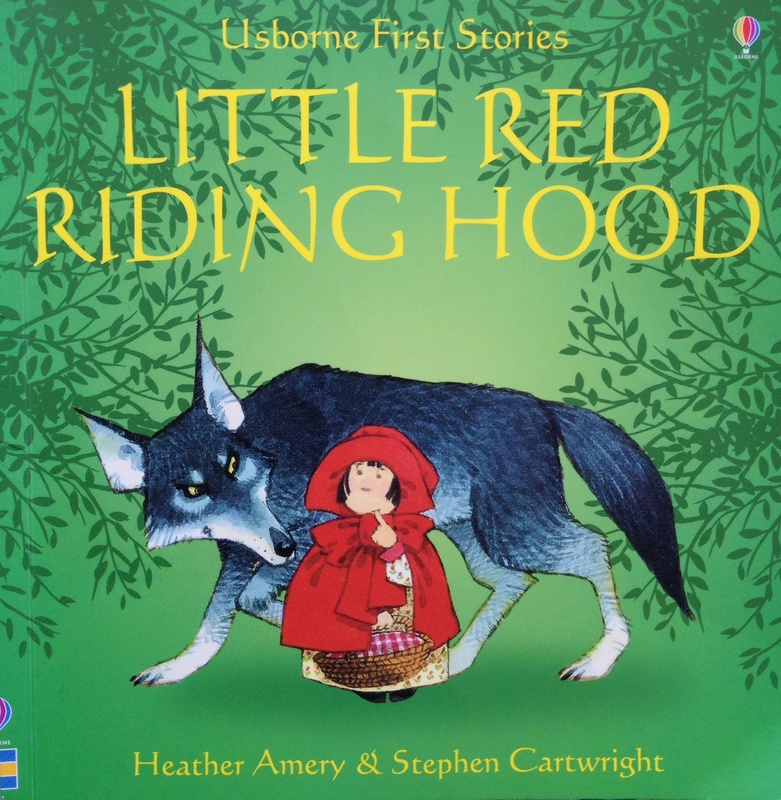 Little Red then enters her Granny’s house and the wolf goes through the regular lines about her eyes, ears and teeth being so big. Then, the wolf gobbles her up too!! However, the next page goes like this! The following picture shows the three of them sitting at the dinner table smiling away, unscathed, with no signs showing that they both were in the belly of a beast moments ago. I give a quick kiss on E’s forehead and head straight to the kitchen for my two ‘healthy’ glasses of red wine. As I tucked in to my first glass of vino, I couldn’t stop thinking about how they came up with such a pathetic ending. What were they thinking?! This author/illustrator combo drew up the idea to have the wolf eat both the Granny and little girl with his, ‘sharp teeth’ and then simply erase that problem by having the random ‘woodsman’ cut them out to perfect health!! Why didn’t they just put, “AND IT WAS ALL A DREAM!” on the last page? As I write this, I’m trying to come up with a worse version and I’m struggling. If I were to do a quick adaptation of the original, it would play on how sometimes children intentionally delay and annoyingly maneuver you off of your original path. For example, after the Big Bad Wolf says, “All the better to see you with!” Little Red could ask, “Why?” Then, after the Wolf says, “Because I like watching you,” Little Red Riding Hood could ask, “Why?” again. And so on and so on until the Big Bad Wolf throws his hands up in frustration and storms out of the house. You see, children are a lot smarter than given credit for. When they repeatedly ask, “Why?” over and over again, they know what they’re doing, just like Little Red Riding Hood knew that the hairy animal laying in the bed was not her Granny. Have you read any crazy versions of classics like this one? I’d love to hear your thoughts in the comment box. Also, like and follow this for more stories about my life in Hong Kong. Thanks Lynda with a ‘y’! Really glad to hear that you enjoyed the blog! Stay tuned for lots of other wild Hong Kong posts that will go very nicely with a glass of red! Hansel in Gretel is an impressive story but definitely shouldn’t be read to young children. Just the thought of parents putting their lives ahead of their kid’s is disgusting. But, what makes me the angriest is how the father let’s the mother-in-law talk him into a plan that more than likely would result in a painful death. And then for the father to send them out again! This guy is just pathetic! Here’s another book painting the mother-in-law as the evilest character. Poor mother-in-laws! The question I ask students about this book is whether or not they would return to their father’s house after such betrayal. Although most said that they wouldn’t. I think the majority would because children are so trusting of adults and would not understand the severity of their parent’s previous decision. They would focus on bringing that treasure back to their parents to make everything ok.
Definitely a good book to read children at the right age because it brings up good conversation on forgiveness and priorities. Cant blame the mothet-in-law – its the evil step mother – as usual…. Yes, those poor step mothers!! You had me laugh out loud… Thanks! Music to my ears Christy!! I think as a parent, you can find teaching points in every story, and you don’t necessarily have to read the text on the paper. I regularly tell my own story, using their pictures. This entry was posted on November 27, 2013 by theguestroom in myHK and tagged Best, Blog, HK, Hong Kong, Little Red Riding Hood, Red Riding, Top, wolf.